Oh, sweet fruit of the gods! Sometimes Mother Nature lends us such extraordinary things, such vibrant colors and creative shapes, the woman in charge is obviously an artist. I remember well my first encounter with these fruits, in Vietnam during grad school a decade ago (Geez — am I really that old?!?). The women on my street sold dragonfruit from rattan baskets, and my colleagues at the Women’s Union told me it was very nutritious. A gift to the complexion, they said. Eat one every day, and I would never be lost without a man. At the time, the white dragonfruit was enough to amaze me. 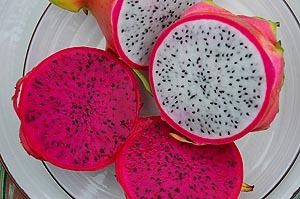 But the red dragonfruit is a regular item in our market here, and I must admit I’ve wondered at times whether its color could possibly be true. Such an intense pink that only appears in the tropics. It oozes fuchsia and stains the fingers (stains your urine, too!). And now I’ve found this fantastic dragonfruit site, with all sorts of interesting tidbits about this cactus, native to Central America (the Aztecs documented it centuries ago). This fellow blogger calls it “the perfect Aztec fruit.” When we get our land in New Mexico, I’d like to plant a dragonfruit garden. These are super cool fruits! They are also another good example of a food item that has gone around the world and become an integral part of other cuisines (like peppers, garlic, etc). I always think that is one of the coolest things about food. These plants are true natives of the America’s, they are a species of cacti! The red dragon fruit color is very similar to prickly pear cactus fruit, (a distant relative of Dragon Fruit, called “tuna” in Mexico, but tastes nothing like tuna!). It is used in some yummy mixed drinks around here (ABQ). 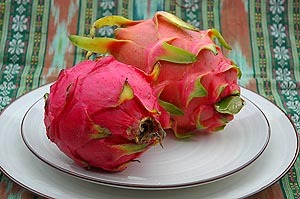 Unfortunately, I don’t see Dragon Fruit around town much, but there’s lots of pricly pear fruit to be had! Good read. I’ve just recently discovered the red flesh variety and loving it. The color is so vibrant and intense.